Whether you have a new upcoming event, a software release or even a scheduled maintenance and needs to inform your customers without sending out thousands of emails, you could simply use the trakdesk announcement feature and publish an announcement in a single click. Announcements can be displayed on specific and multiple customer support portals, and for specific date / time intervals. For example, let's say you have an upcoming event for the 20th and today is the 1st, but you only want to display the announcement from the 12th onwards, you can create the announcement and schedule it to display from the 12th to 20th. Once the end date / time has passed, the announcement will considered to be expired and will be automatically removed from the list of active announcements. Public announcement - Visible to all customers and agents. Login to your helpdesk as an administrator or an account that has Manage announcements permission. On the dashboard, click on the Add announcement option. Enter a title and body for the announcement. You must also select at least one brand / portal to display the announcement on, a status and type. 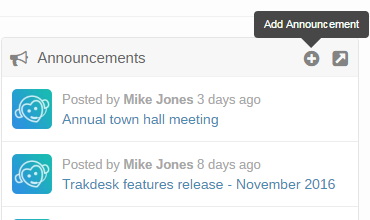 Additionally, you can setup specific date / time period as to when the announcement should be displayed. Finally, click on the Submit button to save the announcement.